Model 400-DIG Drive Up Payment Drop Box mounts in the ground and accepts up to 100 Payments. 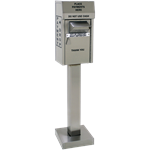 The Model 500-DIG Drive Up Payment Drop Box is mounted in the ground and accepts 300 payments. The Model 600-DIG Drive Up Payment Drop Box installs in the ground and accepts 500 payments. 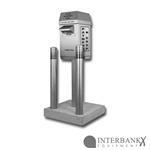 This model is just one of the wide array of choices in payment drop boxes available. Click here for the full selection.